Virat Kohli is known for breaking records in the world of cricket but this time around some records were made against him and his team Royal Challengers Bangalore. 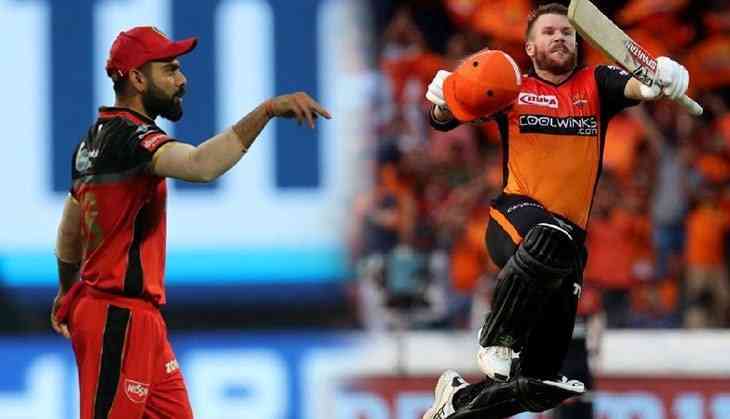 Sunrisers Hyderabad inflicted a humiliating loss to Virat Kohli and his men and also broke some records in the process. Hyderabad’s David Warner and his opening partner Jonny Bairstow recorded the highest opening partnership in the history of Indian Premier League. Their partnership of 185 was the highest after Kolkata Knight Riders’ Gautam Gambhir and Chris Lynn’s 184 not-out. Both David Warner and Jonny Bairstow hit a wonderful century and thus became the second pair to score two centuries in an innings. Virat Kohli and AB de Villiers were the first pair to do so when they registered a record second wicket 229 run partnership. Jonny Bairstow became the second batsman to convert his first IPL fifty into a century. Brendon McCullum was the first man to do it in 2008 while playing for Kolkata Knight Riders. With the help of David Warner and Jonny Bairstow, Hyderabad registered the highest target of IPL 2019 as they scored 231 runs in the first innings. Hyderabad also won the game by a highest margin of IPL 2019. Sunrisers Hyderabad defeated Royal Challengers Bangalore by 118 runs after RCB’s top order was demolished by Hyderabad’s bowling attack. Mohammed Nabi registered the best bowling figure of IPL 2019 as he took 4-11 in 4 overs. Seven RCB batsmen were dismissed for a single digit score including Virat Kohli and AB de Villiers.